One of the developers of MEDUSA, a commercial CO2 forecast system She is a genius who uses MEDUSA at age of 10 to control market and engrossed in money game, believing that money is everything. She hides her true face when talking to others through her computer console because she doesn&#039;t like people. She possesses a teddy bear (named Pudding) which she talks to as if it were a real person. Pudding "responds" to Karin&#039;s comments though one would assume it is actually Karin talking to herself in a funny voice. Her parents are actually dead during an air crash, but she is made to believe that they are very busy with work, leaving her alone all the time. Karin buys out the entire Akihabara for her own after getting tired from shopping around. After she tries to hack into Zeus, she is pursued by Atlas authority. She escapes arrest by escaping to Akihabara. As the story progresses, her personality becomes slightly accepting of people as she only hides her eyes with sunglasses when she talks to them. 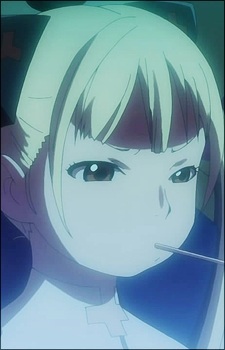 She tries to make Mikuni the successor of Atlas when Mikuni seeks refuge in Akihabara.